The renowned Cherokee name returns to the Jeep® vehicle lineup for the 2014 model year. The result – the all-new 2014 Jeep Cherokee completely redefines the mid-size SUV segment, delivering legendary Jeep 4x4 capability, a segment-first nine-speed automatic transmission, fuel economy improvements of more than 45 percent (versus the outgoing Liberty model), superior on-road ride and handling, a cutting-edge, revolutionary design, world-class craftsmanship, class-exclusive technology and more than 70 advanced safety and security features. The Jeep Cherokee is set to delight consumers both on the road and on the trail. The all-new 2014 Jeep Cherokee provides a choice of three innovative 4x4 systems for best-in-class 4x4 capability in all weather conditions. 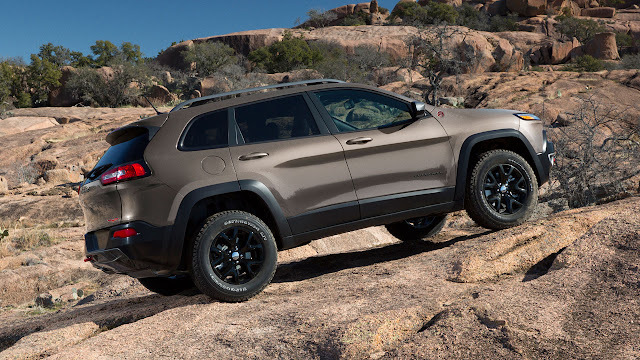 The Jeep Cherokee is the first mid-size SUV to feature rear-axle disconnect, resulting in reduced energy loss when 4x4 capability isn’t needed, improving fuel efficiency. The rear-axle disconnect seamlessly switches between two- and four-wheel drive for full-time torque management and does not require input from the driver. The Jeep Cherokee offers best-in-class V-6 towing capability of 4,500 pounds. Jeep Active Drive Lock includes all the features of Jeep Active Drive II and adds a locking rear differential for superior low-speed power for severe off-road conditions. Jeep Active Drive Lock is standard on all Trailhawk models. All 4x4 systems feature the Jeep brand’s renowned Selec-Terrain traction control system, which allows the driver to choose the on- and off-road setting for optimum performance. Five customized settings are offered: Auto, Snow, Sport, Sand/Mud and Rock. Through the use of algorithms that enable unsurpassed control and capability, Selec-Terrain electronically coordinates and optimizes up to 12 systems on any terrain providing enhanced vehicle control including: drivetrain control module, electronic brake controller, electronic stability control (ESC), transmission controller, powertrain controller and Selec-Speed Control (Hill-ascent and Hill-descent Control). 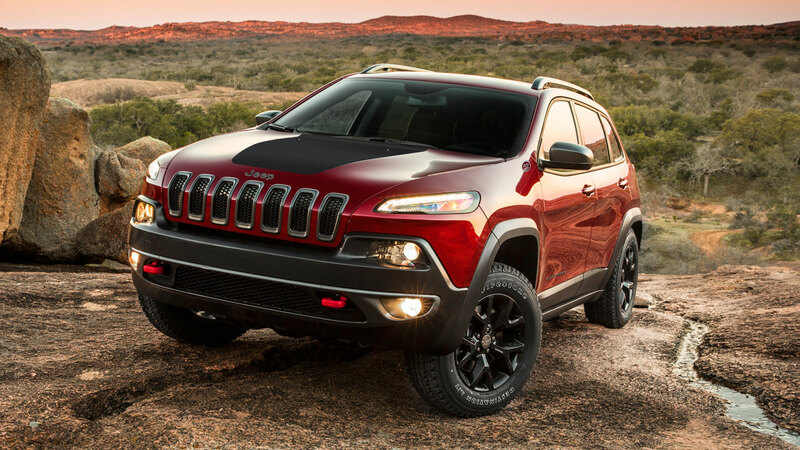 The all-new 2014 Jeep Cherokee Trailhawk model exemplifies Jeep 4x4 capability with a distinctive, aggressive look, backed up by Jeep Trail Rated hardware, for the most capable Jeep Cherokee model and the most capable mid-size SUV in the segment. 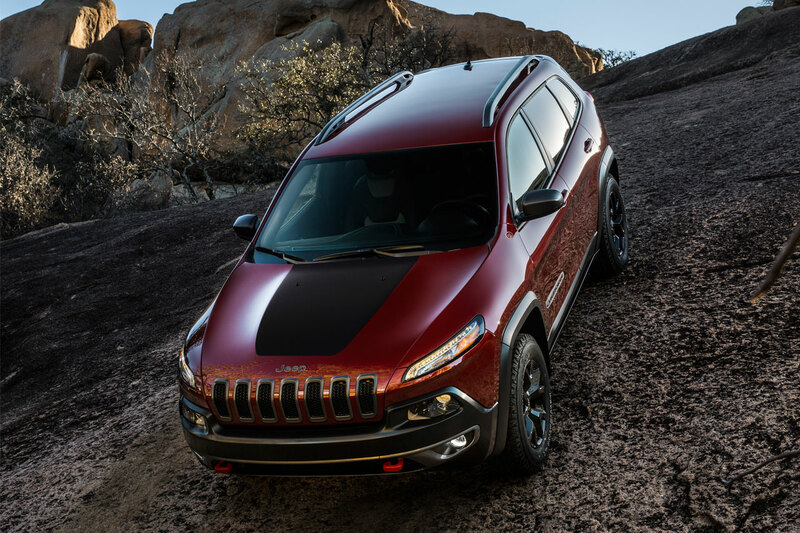 The Trailhawk includes as standard equipment aggressive approach and departure angles, complements of the unique front and rear fascias, one-inch factory lift, Jeep Active Drive Lock with locking rear differential, skid plates and signature red tow hooks. The locking rear differential is selectable in any low range terrain mode, but will lock automatically when in certain modes, such as “Rock,” to maximize tractive effort at the tire patch that can support it. The Jeep Cherokee Trailhawk boasts an approach angle of 29.8 degrees, a departure angle of 32.1 degrees and breakover angle of 23.3 degrees. Running ground clearance is 8.7 inches. The all-new 2014 Jeep Cherokee Trailhawk model with the standard off-road package is Trail Rated. The “Trail Rated” badge on the Jeep Cherokee Trailhawk indicates that the vehicle is designed to perform in a variety of challenging off-road conditions identified by five key consumer-oriented performance categories: traction, ground clearance, maneuverability, articulation and water fording. FIAT Group architecture is the basis for the underpinnings of the all-new 2014 Jeep Cherokee. The Compact U.S. Wide (CUS-wide) platform’s proven modular architecture means many models can be built using the same basic underpinnings. The result is better quality and reliability, as well as lower costs, less development time and tooling. The architecture Cherokee is built on is comprised of common, modular and interchangeable components and allows for modularity of the wheelbase, front track, rear track, front overhang, length and width across vehicle lines. The 2014 Jeep Cherokee’s body structure has a high-strength steel content of roughly 65 percent. Hot stamped-, high-strength- and ultra-high-strength steel are used to construct a strong, lightweight, solid vehicle architecture. The 2014 Jeep Cherokee premium on-road manners and fuel efficiency are a result of a number of efforts by Jeep engineers. Powered by the choice of two new engines mated to a segment-first nine-speed automatic transmission, the all-new Cherokee delivers the power drivers appreciate on the road with fuel economy improvements of more than 45 percent compared with the outgoing model. With expected highway fuel economy ratings of up to 31 miles per gallon (mpg) and a driving range on a tank of gasoline of nearly 500 miles, the all-new 2014 Jeep Cherokee delivers drivers a no-compromise ownership experience. The all-new 2014 Jeep Cherokee features Chrysler Group’s 948TE nine-speed automatic transmission, the first time a nine-speed automatic transmission has been used in the segment and is standard equipment in all models of the new Cherokee. The nine-speed transmission delivers numerous benefits customers will appreciate, including aggressive launches, smooth power delivery at highway speeds and improved fuel efficiency versus a six-speed automatic transmission. Efficiency and refinement also are hallmarks of Chrysler Group’s 16-valve, 2.4-liter Tigershark MultiAir 2 I-4 engine, which comes standard in the all-new 2014 Jeep Cherokee. The 2.4-liter Tigershark engine offers up to an estimated 31 mpg highway fuel economy rating, a more than 45-percent improvement versus the outgoing model, and a driving range on a tank of gasoline of nearly 500 miles. The 2.4-liter MultiAir 2 Tigershark I-4 engine produces 184 horsepower and 171 lb.-ft. of torque. The acclaimed electro-hydraulic fully variable valve-lift system uses a column of oil in place of the traditional mechanical link between the camshaft and intake valves. As a result, it delivers precise control of the intake-valve events – beginning and end – delivering reductions in engine-pumping losses and increases in volumetric efficiency. In addition to reducing carbon-dioxide emissions, MultiAir accounts for a fuel-economy boost of up to 7.5 percent, compared with engines with conventional valve trains. The 2.4-liter is the third engine to feature MultiAir technology from Chrysler Group and features the second generation “MultiAir 2” system that further enhances combustion control, improves fuel efficiency and reduces exhaust emissions. Performance ratings for the 2.4-liter engine are 184 horsepower (137 kW) and 171 lb.-ft. (232 Nm) of torque. The available new 3.2-liter Pentastar V-6 engine is the first derivative of the celebrated 3.6-liter Pentastar V-6, named one of Ward’s 10 Best Engines three years running. The available new 3.2-liter Pentastar V-6 engine benefits from the same innovations that earned its larger displacement predecessor industry–wide acclaim for efficiency, power and refinement. For the driver, that means a refined driving experience with reduced noise, vibration and harshness (NVH) and an exceptional balance of higher specific power output (84.2 horsepower per liter) while delivering fuel economy improvements of 30 percent versus the outgoing V-6 engine. The 3.2-liter Pentastar V-6 engine produces 271 horsepower, 239 lb.-ft. of torque and delivers best-in-class V-6 towing of 4,500 pounds. The all new Jeep Cherokee mid-size SUV sports a new front independent suspension with MacPherson struts and a new rear independent multi-link suspension. The front suspension provides 6.7 inches of travel while the rear suspension provides up to 7.8 inches of travel for better articulation. The isolated rear cradle, aluminum front crossmember and superior torsional rigidity all contribute to the quieter, smoother ride and superior handling characteristics drivers will experience in the Cherokee. The 2014 Jeep Cherokee is equipped with an electronic power steering system (EPS) that improves fuel efficiency and contributes to the Jeep Cherokee’s nimbleness with a turn circle radius of approximately 36 feet in 4x2 models, approximately 38 feet in 4x4 models and roughly 39 feet in the Trailhawk off-road model. With EPS all of the power assist is provided via an electric motor system rather than a traditional hydraulic system. Because the system is fully electronic, the driver experiences optimal steering effort at all vehicle speeds, and there is less noise and better fuel efficiency since there is no parasitic loss from a power steering pump. The 2014 Jeep Cherokee mid-size SUV debuts a new exterior designed for the future with a global appeal. Jeep designers were inspired to create a vehicle that moves Jeep into the next era with a shape that is efficient without losing Jeep DNA and design heritage. The all-new 2014 Jeep Cherokee is a vehicle that not only looks efficient and capable, but is efficient and capable - in all on-road, trail and weather conditions. Fluid, sleek exterior lines highlight the efficient, wind-splitting upper body of the all-new Cherokee. The rugged, protective lower body conveys the legendary capability that is characteristic of every Jeep. The 2014 Jeep Cherokee has a powerful stance, an aggressive wheel-to-body proportion and a commanding road presence. The aggressive approach and departure angles contribute to the best-in-class capability. The first key feature in the front of the all-new 2014 Jeep Cherokee is the waterfall hood with the iconic peaked, seven-slotted grille which includes a crisp, horizontal snap – a feature in many classic Jeep vehicles. The hood is clearly defined and separated from the front fenders in a modern twist of Jeep heritage. The one-piece hood and grille assembly ensures a precise build. Advanced LED lighting technology is used throughout the all-new 2014 Jeep Cherokee. Forward lighting features a unique daytime running lamp (DRL) shape that plays a dominant role in the fresh front-end proportion, giving the impression of a slim headlamp. Contemporary full LED tail lamps are an integral part of the rear backlight graphic, making the vehicle look stronger yet harmonious. This graphic is the connection between the upper and lower rear and brings a unique presence specific to this all-new Cherokee. 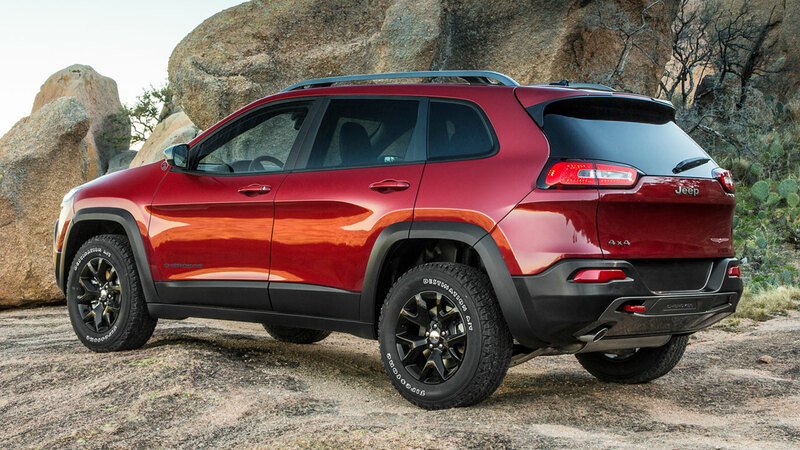 The Trail Rated 2014 Jeep Cherokee Trailhawk model takes rugged design and capability to a whole new level. With exclusive exterior and interior colors, functional differences such as Jeep signature red front tow hooks, skid plates underneath and aggressive front and rear fascias add to the rugged exterior appearance and deliver exemplary approach and departure angles for class-leading 4x4 capability, resulting in the most capable mid-size SUV in the market. The 2014 Jeep Cherokee offers customers two industry-exclusive open-air options – the new CommandView panoramic sunroof or the Sky Slider full-length open canvas roof. The interior of the all-new 2014 Jeep Cherokee is modern, inviting and comfortable. A sophisticated, refined design, hand-sculpted forms, signature Jeep design cues, high-quality materials, precision craftsmanship and attention-to-detail raise the bar in the mid-size SUV segment. A driver-oriented cockpit loaded with easy-to-use, useful technology, clever, thoughtful storage features and more than 70 available safety and security features including 10 standard air bags give the driver and passengers everything they want for any adventure they undertake. Inspiration for the all-new 2014 Jeep Cherokee mid-size SUV interior included countries and terrain around the world that brought beautiful imagery to mind. The Cherokee interior is a sophisticated blend of hand-sculpted fluid shapes, high-quality materials, innovative color and material choices, precision craftsmanship, state-of-the-art technology and features that drivers and passengers appreciate. Premium materials abound wherever the customer touches the vehicle – the door uppers and armrests, the center armrest, the upper instrument panel. Interior trim that is soft to the touch and pleasing to the eye is found throughout the cabin. Seats in the all-new 2014 Jeep Cherokee are ergonomically designed to support the contour of the body, are trimmed with premium cloth or quality Nappa leather and available as power adjustable, heated/ventilated seats with memory. Premium cloth fabrics include a unique interlocking graphic. The 60/40 split second-row seats adjust fore and aft for increased passenger comfort and cargo flexibility. Unique features such as the available heated, leather-wrapped steering wheel, heated and ventilated front seats, an available wireless charging pad and many more will delight both drivers and passengers alike. The all-new 2014 Jeep Cherokee was designed with thoughtful, state-of-the-art, high-tech features and amenities that are intuitive, easy-to-use. The easy-to-use instrument cluster displays the basic information a driver needs at his or her fingertips but also allows the driver to add information they desire, similar to an iPhone. The driver can select from a multitude of information that can be displayed in the center of the gauge cluster including turn-by-turn navigation, speed, real-time fuel economy, safety warnings, available Adaptive Cruise Control-Plus, audio information and Jeep-specific features including Selec-Terrain. The available ParkSense Parallel/Perpendicular Park Assist System (first Chrysler Group availability) is displayed in the center of the gauge cluster and operated with buttons on the steering wheel and the shifter. The graphic walks the driver through the steps necessary to utilize the park assist system. Jeep designer’s passion for the brand shines through in the park assist screen, which features a 1941 Jeep Willys graphic on each side of the open parking space. An available award-winning 8.4-inch touchscreen multimedia command center – the largest in the segment – or the standard 5-inch touchscreen multimedia command center are attractive, intuitive and easy-to-use, and located in the center stack. 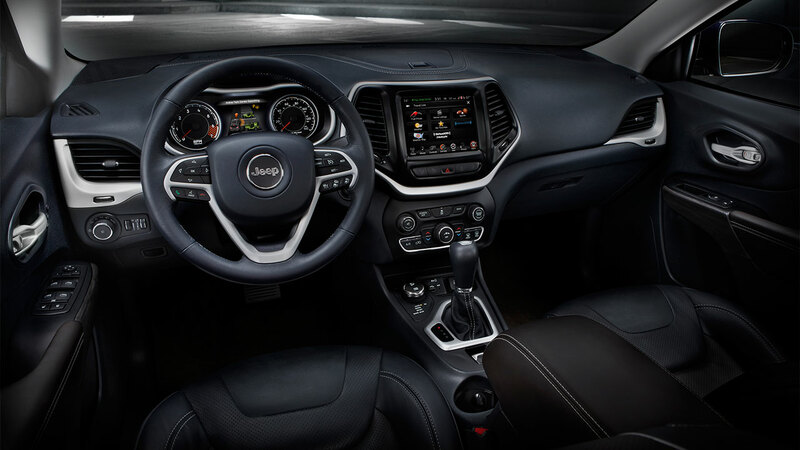 The 2014 Cherokee equipped with the Uconnect system allows the driver to control the audio, climate, heated/ventilated seats and much more from the touchscreen, redundant controls located on the center stack below the touchscreen or with voice commands. The touchscreen buttons are large and easy-to-see at a glance. The 8.4-inch color touchscreen Uconnect Access is user-friendly and includes Bluetooth connectivity, SiriusXM Radio, navigation, music, apps (Pandora, Aha, iHeart Radio and more), voice-to-text messaging and streaming audio capability. The class-exclusive Jeep Cargo Management System makes the most of the cargo space in the all-new 2014 Jeep Cherokee. A universal module rack is mounted on the side in the rear cargo area and provides for hooks and a removable grocery bag. Other optional accessories compatible with the system are available through Mopar and include an off-road accessory kit for Trailhawk models that features a tow rope, gloves and more; cargo bin, cargo mat, foldable cooler and first aid/emergency kit are just some of the accessories available that mount securely to the rack for secure storage solutions the adventurous customer desires. 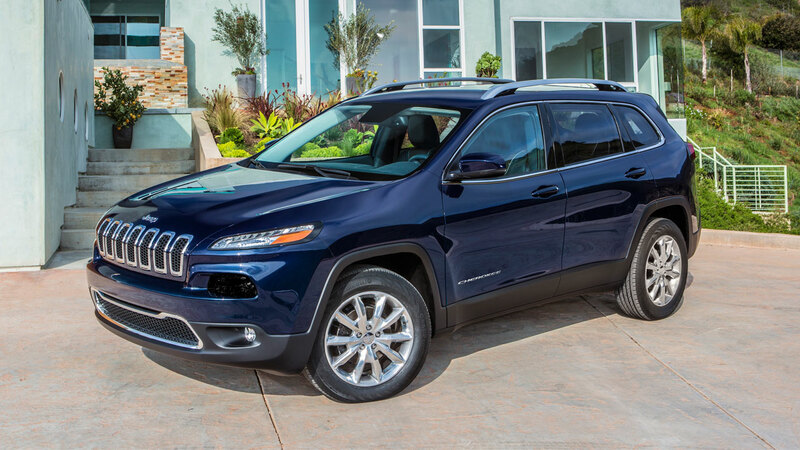 The new Cherokee was engineered with more than 70 available safety and security features. The Jeep Cherokee starts with a strong foundation constructed with 65 percent high-strength steel. Engineers then added both active and passive safety and security features, including: Chrysler Group vehicle firsts ParkSense Parallel/Perpendicular Park Assist, Adaptive Cruise Control-Plus, Forward Collision Warning-Plus, and Lane Departure Warning-Plus; 9-1-1 assist call; ESC; Electronic Roll Mitigation; Blind-spot Monitoring; Rear Cross Path detection; ParkView rear backup camera with dynamic grid lines and 10 standard air bags. The ParkSense Parallel/Perpendicular Park Assist feature in the all-new 2014 Jeep Cherokee is a first in a Chrysler Group vehicle. Using ultrasonic parking sensors on the bumper the system will find and guide customer into an available parking space when the driver initiates parking maneuver. The parking guidance system controls the steering angle automatically, the driver controls the gear position, brake, and accelerator. Parallel parking is possible on either side of the car; during perpendicular parking, the vehicle is backed into the space. Adaptive Cruise Control-Plus, a first for a Chrysler Group vehicle, is significant for its capacity to bring the vehicle to a complete stop without driver intervention in certain conditions. Radar and video sensors identify the locations of vehicles traveling ahead of the 2014 Jeep Cherokee. The sensors also help ensure the vehicles are separated by a gap determined by the driver. If the gap is dramatically breached, the ESC system can aggressively deploy the vehicle’s brakes to affect a full stop, even if the driver never touches the brake pedal. To resume travel, the driver need only press a button on the steering wheel or tap the accelerator pedal. 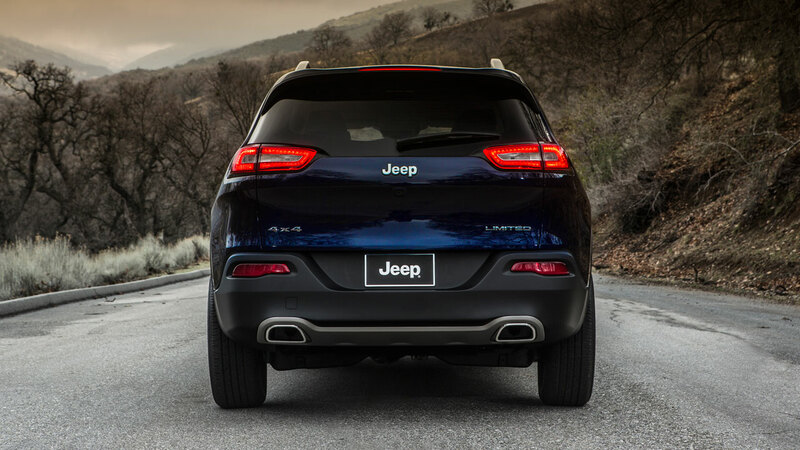 Lane Departure Warning-Plus, which is offered for the first time in a Chrysler Group vehicle, uses a camera-based vision sensor to establish the Jeep Cherokee’s position on the road. If there occurs an unintentional lane drift, determined by trajectory change and the absence of turn-signal activation, the system will deliver a visual warning and a haptic warning – the subtle introduction of torque from the electric power steering (EPS) system. If the driver unintentionally drifts too far, the system provides a secondary visual warning. The 2014 Jeep Cherokee boasts numbers that make the difference for the SUV customer that cares about fuel economy and capability in all weather conditions — fuel economy improvements of more than 45 percent, more than 70 safety and security features, numerous industry and segment “firsts,” a nine-speed automatic transmission, a 3.2-liter Pentastar V-6 engine with 271 horsepower and 239 lb.-ft. of torque, a 2.4-liter MultiAir2 Tigershark I-4 engine with 184 horsepower and 171 lb.-ft. of torque, nearly 500 miles driving range on a tank of gasoline and three new, innovative 4x4 systems that deliver legendary Jeep capability including crawl ratios of 56:1 with the 2.4-liter engine and 47.8:1 with the 3.2-liter engine, an improvement of up to 90 percent versus the outgoing model. The 2014 Jeep Cherokee competes in the mid-size SUV segment, the largest SUV segment in North America, with roughly 2 million sales in 2012. The all-new 2014 Jeep Cherokee is available in four different models in the United States and will arrive in volume in dealer showrooms in the third quarter 2013. Customers can choose from the 2014 Jeep Cherokee Sport, Cherokee Latitude, Cherokee Limited and the rugged, Trail Rated Jeep Cherokee Trailhawk. The Jeep Cherokee mid-size SUV will offer consumers 11 different exterior colors from which to choose: Bright White Clear Coat, Brilliant Black Crystal Metallic Clear Coat, Billet Silver Metallic Clear Coat, Deep Cherry Red Crystal Pearl Coat, Eco Green Pearl Coat, Mango Tango Pearl Coat, Auburn Pearl Coat, Cashmere Pearl Coat, Granite Crystal Metallic Clear Coat, True Blue Pearl Coat, and Anvil Clear Coat. The Cherokee is built in the United States at Chrysler Group’s Toledo (Ohio) Assembly Plant.